No pilot should attempt to fly any of these figures in aircraft not certified for aerobatic flight. Further, no pilot should attempt these figures without training from a competent aerobatic instructor. Descriptions contained in these pages are NOT intended as instruction. They are incomplete as instructional material and will get you into trouble if you believe that they are. This is a list of areobatic figures that have common names. Some of these were invented during aerial combat in WW I. I have included a short verbal description and the IAC symbol for each basic figure. The symbols for the figures follow the rules of the FAI for depicting aerobatic figures. The figure starts at the small solid circle and ends at the vertical bar. All aerobatics figures start and end from horizontal lines in either upright or inverted flight. 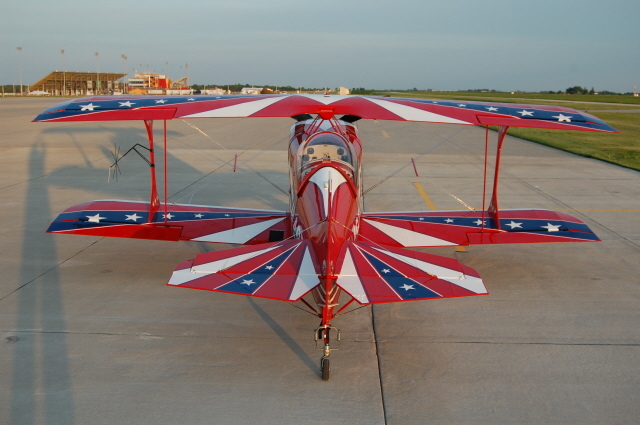 In aerobatics competition, most figures can be entered and/or exited from either upright or inverted flight. This affects the difficulty numbers for the figures. In general, the altitude at which the figure is entered does not have to be the same as the exit altitude. Exceptions are for instance the Cuban Eight, all full loops (regular loop, square loop, etc). In cases where the entry and exit lines have to be the same altitude, they are drawn slightly separated to better show them. The elements used in these figures are horizontal, vertical and 45 degree lines. These describe straight flight in these directions. Solid lines describe upright flight, dashed lines describe inverted flight. Parts of loops connect these line segments (see e.g. the Humpry-Bump). Rolls in 1/4, 1/2, 3/4, etc increments up to 2 rolls can be added to the lines. The looping portions in almost all figures have to have the same radius in all parts of a figure. For instance the quarter loops going into and coming out of a hammerhead have to have the same radius. There are some figures where this does not apply completely. Rolls on vertical lines and on 45 degree lines have to be centered on this line to score well. Any deviation from the center results in a downgrading during a competition. There are other figures that are not in the IAC list of aerobatics figures. These include for instance the Aileron roll and the Barrel roll. I will try to include some descriptions of these too as I go along adding figures. The K-values included with the competition figures give an indication of the difficulty of each of these maneuvers. Higher K-values mean more difficult maneuvers. This list is incomplete. If you would like to see a figure included, please let me know about it and I will put it in. Any comments and additions are welcome, especially help with writing the verbal descriptions. Rolls can be added to most other figures to increase the difficulty factor of the figure. There are two basic types of rolls: slow rolls and snap rolls (flick rolls in european parlance). Snap or flick rolls also have to be flown normally on a straight line. A snap roll is similar to a horizontal spin. It is an autorotation with one wing stalled. Figure 3 shows the symbol for a regular snap roll, figure 4 for an outside snap. In the regular snap, the plane has to be stalled by applying positive g forces. In an outside snap, the plane is stalled by applying negative g. In both cases rudder is then used to start autorotation just like in a spin. This is one of the most basic maneuvers, but not easy to fly well. It has to be perfectly round, entry and exit have to be at the same altitude. The difficulty in flying this manuever well is in correcting for effects of wind drift. In competition, it helps if you don't have to fly first, so you can watch what your competitors are doing and judge the wind drift that you have to take into account. The maneuver starts with a pullup of about 3 - 4 g. Once past the vertical, the back pressure on the elevator is slowly relaxed to float over to top of the loop to keep it round. Past the top, the back pressure is slowly increased again throughout the back part till horizontal flight. The plane has to stay in one plane with the wings orthogonal to the flight path. Rudder is used to maintain the plane of the figure and ailerons are used to maintain the orientation of the wings. This is the basic loop with a roll (usually a snap roll) at the top of the loop. The roll has to be centered at the top of the loop. This is a variation of the basic loop. The two vertical lines and the horizontal line on top have to be of the same length. The exit line at the bottom has to be at least as long as the other three sides. The quarter loops that connect the four sides have to have the same radius at each corner. This is another variation of the basic loop. The two vertical lines, the 45 degree lines and the horizontal line on top all have to be of the same length. The exit line at the bottom has to be at least as long as the other seven sides. The eight loops that connect the eight sides have to have the same radius at each corner. The figure starts with a half loop to inverted flight. A half roll then results in horizontal upright flight. This is one of the maneuvers that have been used in WW I to reverse direction. This maneuver does not preserve speed and altitude. It trades speed for altitude. The figure starts with a half roll to inverted followed by the second half of a loop downward. This is another maneuver to reverse direction. This one, like the immelman, does not preserve speed and altitude. In this case it trades altitude for speed. This figure also is the second half of a loop downward, this time an outside loop. You push forward and fly the second half of an outside loop till you are in horizontal inverted flight. Make sure you are not too fast going into the maneuver, otherwise you may exceed redline speed. Five-eighths of a loop to a down-line at a 45 degree angle. The plane is inverted at this point. Centered on this downline is a half roll from inverted to upright. A pullout to horizontal completes the figure. This is another one of the maneuvers that reverse direction. The downline can be used to adjust the altitude and speed at the end of the figure. Two Half Cuban Eights can be combined to form a Cuban Eight or Lay-down Eight. In this figure in competition the two looping parts have to be flown at the same altitude with the same radius. The exit has to be at the same altitude as the entrance to the figure. This figure starts with a pull to a 45 degree up-line. Centered on this line is a half roll from upright to inverted. Five-eighths of a loop complete the figure to horizontal flight. This again is one of the maneuvers that have been used to reverse direction while preserving altitude and airspeed. Like the Cuban Eight, a Reverse Cuban Eight can be formed by flying two Reverse Half Cuban Eights back to back. This figure is similar to a Full Cuban Eight, but it does not contain any rolls. The second loop is an outside loop. Again, the two loops have to have the same radius and have to be flown at the same altitude. Entry and exit have to be at the same altitude. This also is one of the maneuvers that have been used to reverse direction while adjusting altitude and airspeed by changing the length of the down-line. The figure starts with a quarter loop to a vertical climb. A half loop then results in a vertical down-line. The figure completes with another quarter loop to horizontal flight. The looping part on the top of the figure does not have to be the same radius as the two other looping portions (the quarter loops going into and coming out of the humpty). Again the figure can have optionally rolls on both the up-line and the down-line. Competition turns are not the coordinated maneuvers that you use in normal flying. In a competition turn you first roll to the desired bank. It has to be at least 60 degrees. My experience shows that the steeper the bank, the better the scores. I try to get close to 90 degrees bank. Once the bank is established the turn is started. The plane has to maintain a constant bank and altitude throughout the turn. At the end of the turn the turn is stopped and then the wings leveled for horizontal flight. The example shows the symbol for a 270 degree turn. This maneuver combines a turn with rolls. The example shows a 360 degree turn with four rolls to the inside. The plane has to maintain a constant roll rate, constant turn rate and constant altitude throughout the rolling turn. This maneuver is quite difficult to fly. It requires constantly changing inputs from all three controls (rudder, aileron, elevator). These maneuvers involve bringing the airplane to a complete stop in a vertical attitude and then sliding back a visible amount. The airplane must then tip over and fall through a vertical down position. The left figure indicates a tailslide with the wheels down during the flip, the right figure is a tailslide with the wheels up (inverted) during the flip. Going into the figure and coming out, the same rules apply as for other figures (quarter loops of constant and equal radius, vertical lines). Spins also are aerobatics competition maneuvers. The two figures show a regular and an inverted crossover one turn spin. Spins come in 3/4, one, 1 1/4 and 1 1/2 turns. During spin entry, the plane has to show a stall break, followed by the auto-rotation. The rotation has to stop exactly after the specified number of turns. Once the rotation has stopped, a vertical downline has to be established. In a crossover spin, the plane is first stalled upright. At the stall break, the nose is pushed forward to get into an inverted spin while maintaining the stall. The inverted spin is then completed as it would be for an inverted spin with entry from inverted flight. The Chandelle is not a figure for aerobatics competition. On the FAA power commercial pilots test a Chandelle is defined as a maximum performance climbing turn through 180 degrees while maintaining a constant turn rate. The idea is that this is a "plan ahead" maneuver. You first establish a medium bank depending on the performance of your aircraft. Then a smooth pullup is started. The angle of bank stays constant during the first 90 degrees of turn, while the pitch angle increases steadily. At the 90 degree point the plane has the maximum pitch angle which should be close to the critical angle of attack. During the second 90 degrees of turn, the pitch angle is held constant, while the bank angle is smoothly decreased to reach 0 degrees of bank at 180 degrees of turn with the airspeed close to the stall speed. The plane should not settle during the last part of the maneuver and the recovery. The decreasing bank angle during the second half of the Chandelle will maintain a constant turn rate together with the decreasing airspeed. The turn needs to be kept coordinated by applying the right amount of rudder. A Chandelle to the left is quite different than one to the right because of the ever increasing amount of p-factor in the second half of the maneuver. The Barrel Roll is a not competition maneuver. The barrel roll is a combination between a loop and a roll. You complete one loop while completing one roll at the same time. The flight path during a barrel roll has the shape of a horizontal cork screw. Imagine a big barrel, with the airplanes wheels rolling along the inside of the barrel in a cork screw path. During a barrel roll, the pilot experiences always positive G's. The maximum is about 2.5 to 3 G, the minimum about 0.5 G.